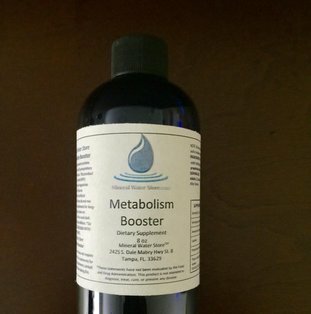 Metabolism Booster is a proprietary blend of minerals to help speed up your metabolism, lowers cortisol levels. Prevents sugar spikes. Lowers sugar craving, reduces appetite and it Improves mental clarity. 1 tsp a day after dinner is all you need. Our metabolism Booster does not create a jittery affect or accelerate your heart rate, so taking it in the evening will not keep you up at night! INGREDIENTS: Reverse osmosis water and trace amounts of proprietary blend of minerals. Prices are for US Shipping ONLY. For International Shipping Please Email us. currently only offering 8oz, Sorry for the inconvenience.